Writing an essay is always about wording. The style, the tone, the rhythm of your paper will depend a lot on the words you chose. There are numerous literary techniques that help the students add the necessary emotional coloring to their essays. So, basically, literary terms help writers and students enrich their texts, turn them into something interesting and exciting. You have probably heard many times that reading helps to develop your own vocabulary. And it really does. While reading you come across and remember lots of literary techniques. You may not even know these are them, but you will subconsciously use them in your speech and writing. 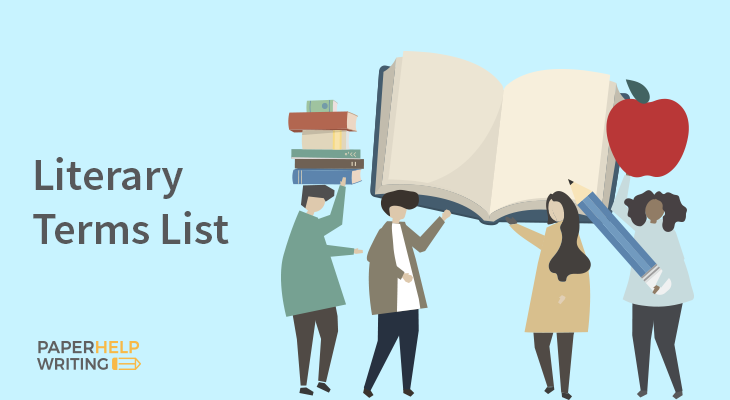 In this article, you will find a list of popular literary terms denoting some literary devices you can use to make your essay the best one. It is not easy to understand literary devices if you are not an expert. And very often, to realize how they are applied and work you need to look through several examples. Literary terms help to grab the attention of the audience. They are used on the so-called hook sentences. If you chose the devices correctly, they will help you convey the information correctly and in the right manner. The terms below are arranged in alphabetical order. Once you master them and realize how to use them, you should definitely add them to your writings. Allegory is the depiction of an abstract notion or phenomenon through a certain character that is a personification of some qualities of properties of people. Alliteration is a technique of using the same consonant sounds to make the speech more expressive. An allusion is a powerful tool called to make poetry more expressive and cause an association in the reader’s mind. It is a hint on a well known literary or historical fact. Analogy means the comparison of two or more objects/phenomenon. This technique helps the author manages to give a better understanding of the object via connections with other objects. An apostrophe is not only the punctuation mark but also the literary device. This is when the author wants to create a person or an object that are not in the place of action at the moment or do not even exist. This tool means the final part of the play or a movie when the questions are answered and the solution found. Dialogue is often used by authors to show the good and the bad person. This technique is the quotation from other author’s work located in the title. When creating your epigraph do not forget about copyright. And make sure you one of the writing style formats such as Chicago, MLA, AMA, etc. With the help of imagery, authors create a visual picture in their readers’ minds. If you want the audience to feel emotions or the mood of your character, this is the tool you should be using. Ironic humor is used to express the meaning that is different from the common or accepted one. It also helps to create the visual image of a person, object or event that is different from the one there is in reality. This is an exaggeration that is meant to make things more dramatic. Such exaggeration should not be taken literary. It is often used in the climax of the story. Metaphor is a hidden comparison based on similarities or contacts of objects, people or phenomena. This is a technique when the author combines two words contrasting in their meaning. This is done to create or express a new unusual notion: hot ice, greedy knight, etc. With the help of parody, the author wants to show and laugh at certain human traits. Personification helps embodying human characteristics to an inanimate object. Using satire humor the author shows the weaknesses of human society and laughs at them. This technique based on the contrast of a phenomenon or a notion with a different phenomenon or notion aiming at highlighting an important indicator of the object of comparison. No matter what kind of paper you are doing, you will definitely benefit from using some of the literary techniques. If you still uncertain which devices to use you can always ask help from experts. Our team will gladly enrich your paper with relevant literary tools to make your paper stand out.